As you probably already know, I did not finish the JFK 50 mile race on November 22nd. This was my goal race for the year. I spent a big chunk of my season preparing for this race. I was excited and I was ready. I researched this race more than I have any other. I read a book about it, I read so many race reports I felt like I could run it in my sleep. I watched every YouTube video I could find. I wanted this race! Sometimes you just don’t have a good day – it happens quite often. Sometimes you stick it out and learn a lot about your body and yourself. And sometimes you throw in the towel. Was I bummed? Of course. But the decision to pull out at mile 38 was totally my choice. There was no one or nothing to blame. I had a bad day and I chose to end it. 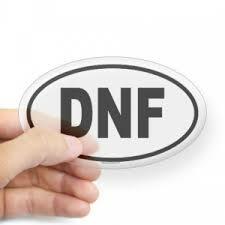 I am not new to the dreaded DNF. Although it doesn’t get any easier mentally I must say that either with age, or simply the ever-growing number of races I have done, I have come to terms with weighing the pluses and minuses of the decision and feeling “okay” with it. Many say that the pain of not finishing is far worse than the pain of sticking it out. I can understand that. Some may say that quitting is a sign of weakness. I understand that view too. For me, I don’t have that burning desire to finish when something is going on with my body. Of course the thought of walking the final 12 miles popped into my head. But that thought was quickly squashed because 1) that would only make me feel worse both mentally and physically, 2) I didn’t feel the need to simply finish the race by walking, and 3) I had a support crew out there in the cold who, although he would’ve supported me the whole way, didn’t deserve to endure the additional hours it would take me to walk. I know there will always be another race. And another race. And another race. Although I spent a lot of time and miles on November 22nd talking to myself about the decision, I feel that I made the right choice for me personally. Having a fellow runner whom I met at Blues Cruise going through the same physical and emotional pain with me at the same point was very helpful. Those last miles would have been exponentially more painful without Mike Dolan by my side. So without further delay, here is my race report of the first 38 miles of JFK. I don’t think it was even 20 degrees when we left the hotel during that dark Saturday morning to head to Boonsboro high school. A chilly reminder as to why I’m not a huge fan of fall racing 😉 But nothing could deter the excitement I had to get out there! The cold wasn’t even a big deal – you have the pre-race meeting in the gym which was warm, and then 15 minutes before the race you walk about a mile to the start line, where they start on time! The sun was out by now and it was a beautiful morning. The start was pretty congested as expected with a race of that size. Plus there is no regard to lining up by your projected pace, which was evidenced when a guy next to me was telling his running buddies that he would be thrilled with an 11:00 pace. However there are 50 miles ahead – plenty of time. Plus the start takes you along roads before transitioning to the Appalachian Trail so there was no rush to get your spot right out of the gate. The gun went off and by the 1/2 mile mark things already started to shake out. There were 2 women that immediately stood out. Justine Morrison, who finished 2nd overall for the day, took the early charge up the winding hills along the road. Quick to chase after her was Sarah Bard – the overall female finisher for the day. It was tempting to stick with them but I held myself back. It was way too early for me to worry about my position, and I really wanted to run my own race. I kept them close, and as we were about to enter the trails Sarah popped off into the port-a-pot and I slipped into 2nd place. I was excited to be on the trails but again tried to keep calm and stick with my plan. The trails were rocky but not very technical compared to what I’ve trained on both in PA and NY. It was hard to hold back when I feel that trails are my strength but at the same time I was trying to baby my left knee that was causing me problems in the 3 weeks leading up to the race. I hadn’t run any trails in those 3 weeks in hopes of keeping the injury at bay so I was unsure of how the rocky terrain would affect it. To my delight everything was feeling fine! Upon arriving at the next road section along the AT I spotted Justine just ahead of me. I was elated to see that she wasn’t too far ahead but I also knew that Sarah had to be right behind me. I kept reminding myself “the race is not won on the AT”. I was feeling good, I was sticking to my pace, and I was feeling confident. And then…BAM! Right around mile 11 – it wasn’t an overly technical spot – it wasn’t even a downhill. I tripped and went down hard – my right knee smashing onto a nice big rock as my body flung forward, twisted, and my hip took the next impact. The guy who had been running behind me stopped saying “oh no – are you okay?” He bent over and grabbed me to help pick me back up but I told him to keep going. I was extremely appreciative of his concern and offer to help but I didn’t want to throw him off his pace. And really – I wasn’t ready to get up yet 😉 I laid crumpled momentarily – in shock that I just tripped for no apparent reason, taking stock of what was going on, and dealing with that rush of nausea you get when a flash of pain hits. I quickly gained my composure and remembered that this was a race – keep going!! It was a painful limp/jog for the next mile and as expected Sarah soon passed me. I was frustrated with my carelessness and remember telling myself “I am not going to let my demise come from a fall on the AT”. I wasn’t even 1/3 of the way into the race! After about a mile, things started to feel better. Kind of like when you’re new to trail running and you constantly twist your ankle. It hurts so bad that you feel you can barely run, but then before long it’s like it never even happened. I was still feeling pain and my knee was bleeding through my tights but I was able to run again – and before long I was back on pace. YES! Just a minor blip. All I needed to do was make it off this trail without further incident and once I hit the flat and forgiving rail trail my worries would be behind me. I was able to pass Sarah again as we started to descend – my confidence was back! I completed the AT portion just one minute over my goal at 2:16. By the time I got onto the C&O canal I was in first place. That moment of holding the lead was brief though, as both Justine and Sarah came flying by me. Again I knew to let them go. I could tell they were both strong runners and that pace would blow me up for sure. My plan was to maintain my goal pace and see what I could do once I got to the final portion of the race – the 8+ miles on roads. My pace felt comfortable as I was settling in both physically and mentally for the marathon on the rail trail. Only a few miles in I could tell that my rock collision was going to cause problems. My theory that the rail trail would be gentler on my body was proving to be wrong. My knee was screaming with each step and my hip was as well. I convinced myself that this was going to be a painful race, but not impossible. The pain could wear off again like it did on the trails. However it wasn’t wearing off – it was only getting worse. And with no one around me on the trail it was getting to be dark place. Literally – other than the aid stations I spent most of those 20 miles completely alone. Alone with my pain and alone with my thoughts. The idea started to creep in that I was going to need to stop running. That of course is followed with the argument in my mind “quitting is not an option. You will not DNF.” No one wants to give up that easily. My pace was slowing but I was still running – that’s all I needed to do. As I was approaching mile 27 where your support is allowed to meet you I was prepared to call it a day. As Jared handed me the items I had requested at that stop the tears came as I explained to him what was going on. He wasn’t having it as he coaxed me to keep running while he handed over my supplies. I really just wanted to stop for a minute. Crying and complaining about the pain I was in made me feel like a big baby and really quite silly, so I pulled up my big girl pants and carried on. And for a moment I mentally felt good again – like I could overcome this. Heck – I was more than halfway done – I could keep going. That mental boost was short-lived as reality set back in. And around mile 30 I really started to fall apart. I was reduced to a jog/hobble and kept repeating “just keep moving forward”. Over and over. Forward progress is progress. This was followed by walking breaks. Ugghhh…dreaded walking breaks. Is anything more annoying? I don’t even know why I was doing it – it wasn’t helping the situation at all. This went on until about mile 36 when during one of my fabulous walking breaks I turned around to see a familiar face. Mike Dolan had passed me in the last few miles of Blues Cruise and we talked after the race about…well JFK of course! He seemed to be in trouble too and he stopped to walk with me. We shared our stories of our unraveling – both of us had fallen on the AT and you can only outrun a damaging impact for so long. I of course felt horrible that someone else was sharing my bad experience today, but I was also very grateful to have him alongside me – sharing the same mental and physical pain together. Misery loves company right? We both decided that we would pull out at mile 38 – the next stop where your support had access. We talked about walking the rest of the race…more than once, we did math in our heads to determine how long this would take, we weighed the options of whether or not that was even worth it. We were now both freezing since our exertion was low, and we considered the people who were there for us. We probably sounded like crazy people as we kept bouncing thoughts off one another. We cursed, we made fun of ourselves as people passed and yelled “great job!”, but most of all we lifted each other’s spirits. We tried to run a few times – each time getting only a few steps before one of us felt the need to stop again. We planned to jog one minute, walk one minute the rest of the way and we only made it through one interval of that. We were a pathetic duo but at least we were not alone. That 2 mile walk felt like an hour (it may have been for all I know!). Finally we approach the 38 mile rest stop where Mike is happy to see his wife hadn’t bailed on him 😉 I knew Jared was there because Pulin had just started driving down the road along the trail on a search mission. Mike and I said our heartfelt goodbye’s and reminded each other that we will get the next one. Once I got into the car that’s when the emotion hit as well as the doubt as to whether or not I made the right decision. My brain knew I did, but the heart wasn’t totally on board yet. Next we had to drive to the finish line to drop off my chip. Just driving along the course towards the finish line made me feel an inch tall. With the last twist of the knife, Sarah was coming towards the finish. She looked great and I was excited for her – this was her first 50 miler and she nailed it! Congrats on a solid performance! That is it. My race and my season ended by a tumble on the trail. Hard to swallow but you do, and then you move on. Some positives for the day: I feel like I was nailing my nutrition – at least for those first 38 miles. My gear selection was spot on. I chose to race in my inov-8 Roclite 243’s. They were perfect for this race as they are the most versatile shoe. They offer protection, grip, and responsiveness on the trails while being lightweight and not too trail-like and cumbersome for the roads. A lot of people change shoes once they come off the AT and I specifically choose the Roclite’s so that I wouldn’t feel any need for that. I also wore my inov-8 Race Elite 200 tights for this chilly day. These tights feel like pajama pants to me, so that is really a no-brainer. Comfort and warmth – win! Then of course there was my trusted inov-8 Race Ultra Vest. I ran the AT with only water in the reservoir, and then (the plan was) grab bottle of electrolyte drink at the support stations. I believe this was the perfect set-up to fuel my race and stash my nutrition. (see my full review of this vest here) Anytime I run trails I like to wear my 110% Flat Out Sox for targeted compression and stability. Under my race singlet I wore my 110% Katalyst Short Sleeve top. They are not kidding when they say it is like a 2nd skin. It’s form-fitting without feeling tight and constrictive, the thermal regulation is like no other top I’ve worn, and you never have to worry about chafing. A hands-down must-have for an ultra event. 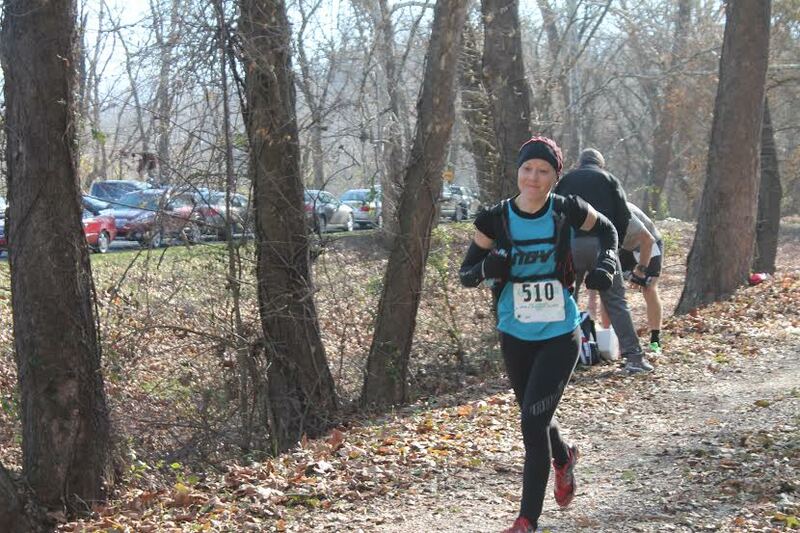 Even without completing the race, I can say that the JFK 50 miler is a well-organized and high energy race. Although you spend many lonesome miles along the rail trail, each aid station is well-stocked with happy and helpful volunteers. I will definitely be back! I of course thank Jared for his support. Not only during the race enduring hours in the cold but also for dealing with my pre-race craziness, and post-race breakdown. I couldn’t ask for a more supportive and caring person to be by my side. Thank you to Pulin Modi who drove up from DC to cheer for me. And take the only decent picture to document my day 😉 And of course a big thank you to all of my friends who sent such supportive and encouraging messages. I am surrounded by the most amazing people! The mental pain has mostly faded. After running for only the 2nd time since November 22nd my knee is reminding me that it’s not quite ready to forget the pain. Rest and recovery are on the menu, as well as lots of time in the gym re-building strength and stability. As I start planning 2015 I am super-excited for another season of awesome racing, unforgettable friends, and many more learning experiences. This entry was posted in race, race report, trail race, trail running, ultra running and tagged 110%, inov-8, JFK 50 mile, JFK 50 mile race, JFK50, race, Race Elite 220, race report, race ultra vest, racing, Roclite, Roclite 243, running, trail racing, trail running by lljkline. Bookmark the permalink. Bummer on DNf, but great job in being out there. Keep going!